I turned three on December 20, five days before Christmas. Shelley, my pet parent, threw a birthday party for me at her favorite coffee shop, the Mandolin Café. She made a cake, and I got to eat some, plus get toys and treats. But really, it’s not enough. Christmas is coming up, and as a very cute dachshund, I should get presents. 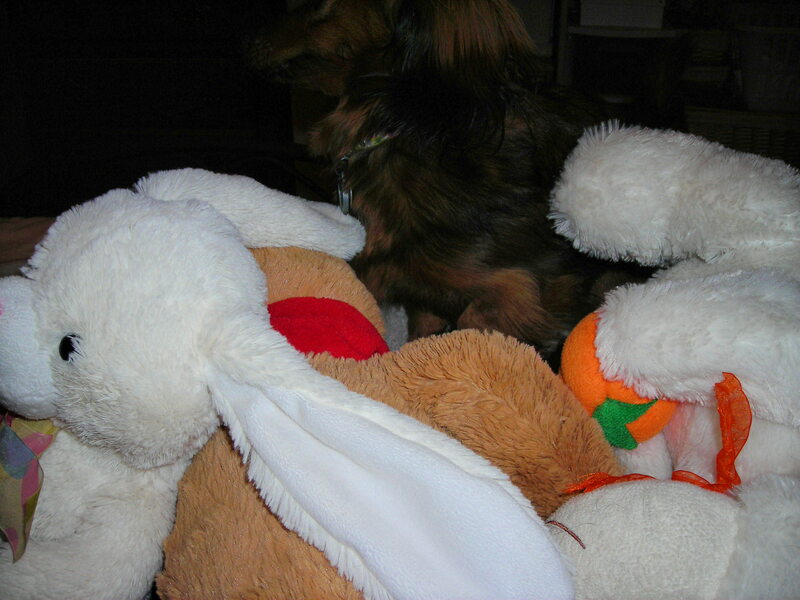 * More toys, like big stuffed animals that are larger than me. I have a few, including Duckie, Big Dog, Doggie and a new unnamed bear that was supposed to be for Christmas, but I claimed it by ripping off the tag and running off with it for some play time. But I could use more friends to add to my lair. * More balls, though I have small, medium and tennis-ball size balls already. * Treats, particularly Pupperoni, anything with chicken or steak and rawhide. * Love, lots of it. And people telling me I’m cute. I’ll stop now, a dog can’t be too greedy, given that there are other dogs on the planet who have needs, too. cute dogs, Cute Puppies, Cute Zoey! I am cute to the 10th power. 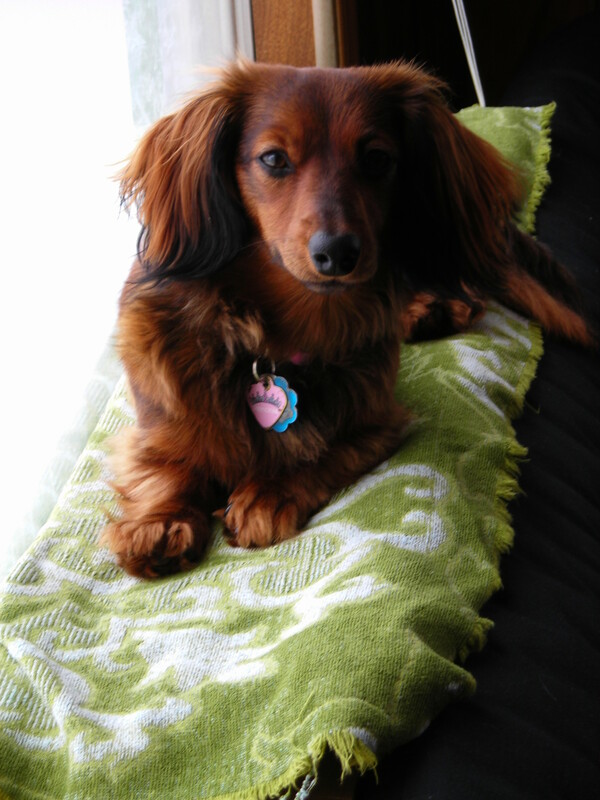 I am Zoey the Cute Dachshund. 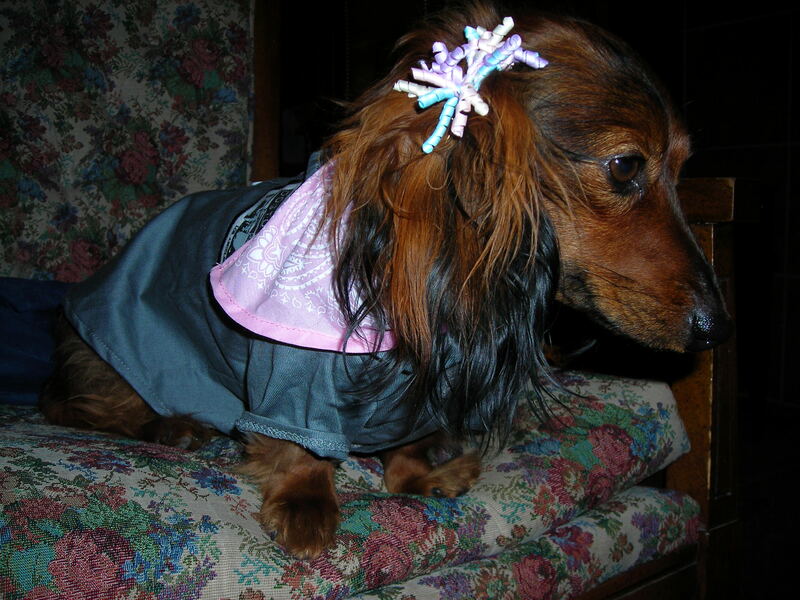 Zoey is dressed up for a night on the town. Zoey seeks some sun while hanging out on her window ledge. Zoey enjoys the sun in a summer past. 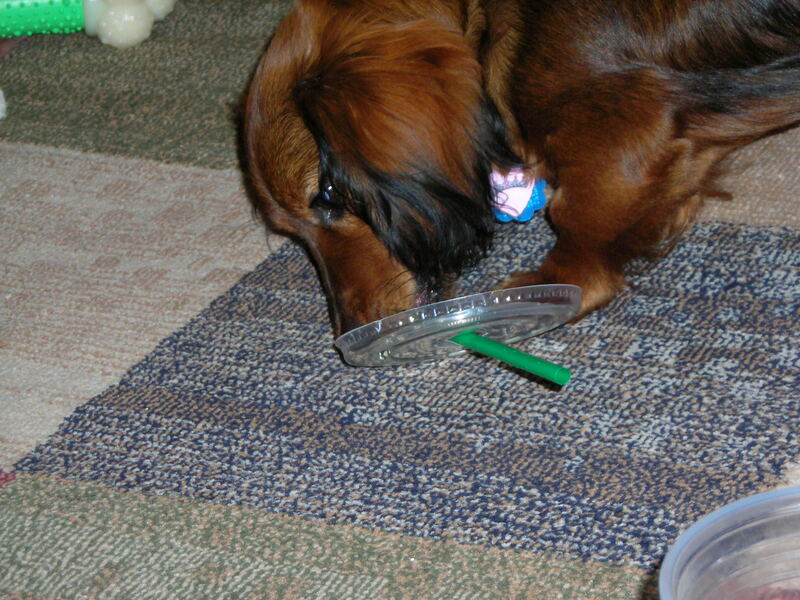 Zoey turns a coffee cup lid into a toy. As I’ve said before, I’m motivated by treats and getting petted. I also want to play chase, tug of war and games of keep away. I especially want to be the center of attention. It’s not too hard for me to meet these goals. 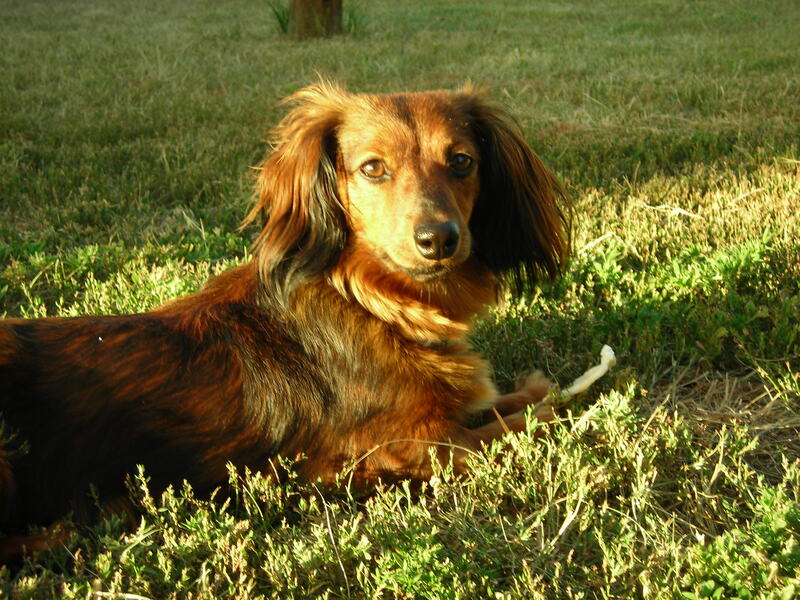 I am a very cute long-haired dachshund, and most everyone loves me, well except for the big dogs. I bark at them, at least when I’m atop a coffee shop table or in someone’s lap, to let them know I’m the queen dog (not bee). I get so many pets and told I’m cute, adorable and pretty. It’s like I’m famous, or so cute that I should be. On Black Friday, I went to PetSmart with Shelley, my parent, and three people in a row stopped Shelley to ask her if they could pet me. I don’t have a big ego, seriously, like right now I am sitting on Shelley’s lap listening to music at this Wednesday Night Hootenanny at the Mandolin Café. A few people have asked to pet me, as usually is the case at my hangout. But I’m being a good girl for Shelley’s sake. A long time ago, she told her friends that she wanted to train squirmy me into a lapdog, and here I am being a lapdog. It took me a few months and a few trips home, but I can bend my will to that of another. I like how the music is different from people’s voices. I can distinguish individual words when I’m being talked to, but music is like a moving string of sound that doesn’t divide with the silent spaces between words. Music sometimes matches my heartbeat or how it feels to take in air and push it into a sigh. So happy I am being here listening and seeing and sighing, engaging my sight, my hearing, my feeling and my ability to be quiet. I don’t have to bark at big sounds, as is the case when I encounter other dogs and have to let them know about my presence. 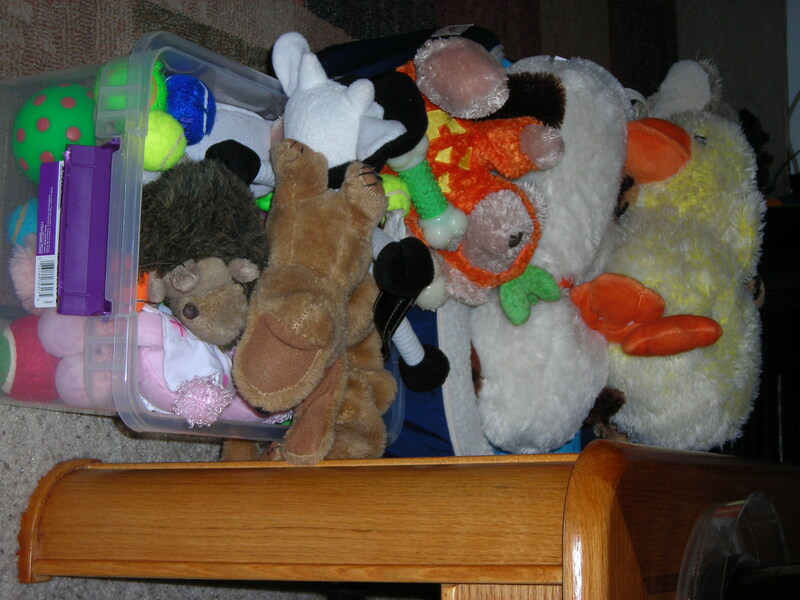 These are some of Zoey's toys. I’m frustrated that I don’t have all the milk bones I want. I’m motivated to get treats and toys and all the play time a girl dog needs, but I don’t always get these things when I want them. Stand on my back legs and cross my paws, looking extra cute. Bark if I get impatient and frustrated. Shelley, my pet parent, says “No noise,” and I have to be quiet and amp up the cute. If I want to play, I grab my stuffed bunny and bring it to Shelley. If she doesn’t throw my toy, I remove the other ones from my toy box until they are all out in a pile of rejection. Usually, Shelley gets the hint and will throw one or get floor bound for tug-of-war. Or I pretend to go to the door and when Shelley reaches for it, I go for a runner, inviting her into chase. My last trick is to bark really loud. If I’m on the couch or the bed, I hang my front paws over the edge and stare with expectation of getting what I’m due. It’s required after all if you take home a dog. We dogs need play and love and sleep and treats. And of course, we are motivated by our love of you. We get frustrated when we try to express our love to your turned back. So we have to make noise, look adorable or grab toys so that you remember what’s important: life isn’t all serious stuff but is about running around happy and free.